Let’s be honest. When the lead starts flying, you can never have enough scenery. Scenery is cover and cover is the difference between survival and extinction. One of the features that makes Combat Zone such a great game for beginners is the ready-to-use scenery that is included in the box. Anyone buying the game can play right away with some nicely printed basic terrain. Pretty soon, more exciting scenery will be bought or made and the original flimsy walls on their ugly plastic stands will be left in the box and lay forgotten. This is a mistake. Let’s be honest, in the deadly world of near future skirmish, you can never have enough scenery because scnerey is cover and cover is the difference between survival and extinction. The Combat Zone scenery is visually attractive but it’s not particularly sturdy. It can however easily be made sturdy and very useable. There’s nothing clever about what needs to be done. The purpose of this article is mainly to persuade you that the box terrain is worth persevering with. 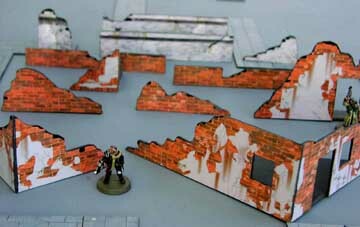 In the Combat Zone set are two identical sheets of die-cut scenery. 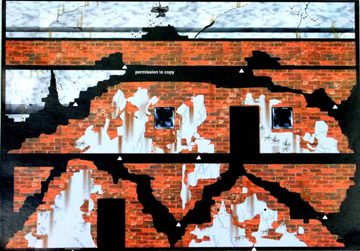 Since each side of the sheets is different and we are only going to feature the printing from one side of each sheet, the finished pieces will all be different; you won’t have the same piece of graffiti, for example, appearing twice..
Let's get to work! Obviously, the first thing to do is press out the individual pieces. Next, they have to be strengthened which is simply done by gluing them to some thicker card; 1.5mm thick mounting board is ideal. Cut out pieces of board about 5mm bigger all round than the scenery piece which is to be mounted on it. Glue the piece to the card using PVA or craft glue then leave them for about 24 hours under something heavy like an old telephone directory, a wargamer’s lunch or a passing mastodon. Remember that you will have two of each piece (once from each sheet) and that they are printed differently on each side. One side has graffiti on some pieces, the other doesn’t so glue the mounting card to the graffiti side of one sheet and the non-graffiti side of the other. This way, although each piece will have a duplicate shape, they will all be different. Once the glue has set the pieces need to have the excess card trimmed from round their edges. Also door and window openings need to be cut out. There is nothing better than a scalpel blade, in a proper scalpel, for this kind of job. However, scalpels are capable of inflicting serious wounds (that’s what they’re for, after all). So if you have any doubt, use a modelling knife. Juniors shouldn’t use sharp blades without adult supervision and adults should be very careful, obeying sensible safety rules such as always cutting AWAY from their bodies and keep fingers out of the line of cutting. For straight cuts, guide the blade with a steel ruler. If you take a look at the low wall sections, you’ll see there are some “damaged” parts. You can either cut the mounting card away so that the gaps are as printed or leave the card in place so that a rough repair can be modelled (as described later!).. Ambush - Two members of the 1st Power Armour Squad ("The Harlequins") about to be ambushed by a couple of scruffy, ill-disciplined gangers. Once the pieces have been trimmed, they need to have a base added to keep them upright! All that’s required is some more of the mounting card glued at right angles to the bottom of the piece. A strip of card 15-20mm wide will be fine. Glue it to the inside of the blank side of the piece. Don’t glue the piece on top of the base or it will show under the printed design. Cut back the ends of the base at an angle of about 45 degrees (see photo) so that 2 pieces can be placed together at right angles to form a corner without the bases overlapping.. The largest piece of scenery, the one with 2 windows and a door, makes a good permanent corner item. After the piece has been glued to the mounting board, cut it in two about 25 mm from the door opening. Cut out a triangular piece of card for the base; this should be about 155mm x 130mm x 200mm. The wall pieces are glued to the 155 and 130mm edges. The resulting piece is a very solid item. 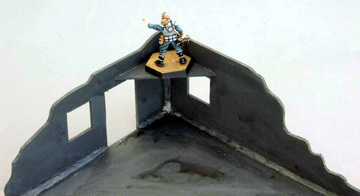 It can also have a small platform glued to the upper level of its corner to provide a raised firing platform (see photo above)..
To reinforce the join between walls and base I added a strip of Milliput modelling putty (see photo). As well as providing extra strength it also gives stability by virtue of its added weight. On the small lengths of wall (less than 60mm long) I covered the whole base in a layer of Milliput to give even more stability..
To finish off, it is necessary to paint the bare card side of the walls. Now that they have printing on one side only, the inside needs to be represented as some form of rendering. A plain light grey makes a good finish ( I painted the pieces in the photos a dark grey so that they would show up better against the light grey playing surface but I’ll probably repaint them light grey now the photos are taken). If you want a rougher finish, simply mix some fine sand into the paint to give a breeze/cinder block look..
To quickly simulate a rough repair look to the damaged sections of low wall mentioned earlier, just paint the backing card (which you didn’t trim away) a dark grey, use a fine brush or pen to mark our individual stones with black lines and then dry-brush the middle of each stone with light grey. A repaired patch like this can be seen in the article "Doug's Terrain" in this issue of the Chronicle..
With a little effort, you can turn that nice looking but thin card that came with the game into sturdy and useful “filler” scenery to augment your more exotic pieces. There’s a lot of it and you’ve already paid for it. Use it! thick mounting board is ideal. Cut out pieces of board about 5mm bigger all round than the scenery piece which is to be mounted on it. that’s required is some more of the mounting card glued at right angles to the bottom of the piece. A strip of card 15-20mm wide will be fine. Glue it to the inside of the blank side of the piece. Don’t glue the piece on top of the base or it will show under the printed design. Cut back the ends of the base at an angle of about 45 degrees (see photo) so that 2 pieces can be placed together at right angles to form a corner without the bases overlapping..
To quickly simulate a rough repair look to the damaged sections of low wall mentioned earlier, just paint the backing card (which you didn’t trim away) a dark grey, use a fine brush or pen to mark our individual stones with black lines and then dry-brush the middle of each stone with light grey. A repaired patch like this can be seen in the article " in this issue of the Chronicle.. If your scenery allows it, put the supports on the front of your walls, and paint them as pavement.